← Kickstarter Campaign Could Launch The First Soccer Game Where the Object is to Corrupt the World’s Favorite Sport! Alpine Adventures in Dubai – Yes, You Can Ski in the Desert! When one thinks of world-class ski resorts, the image of small villages nestled on the slopes of great snow-capped mountains comes to mind. One would hardly expect to find a skier’s paradise in the Persian Gulf. However amidst the great sand dunes of the Arabian Peninsula is the state of Dubai in the United Arab Emirates, and they think that notion is hogwash. 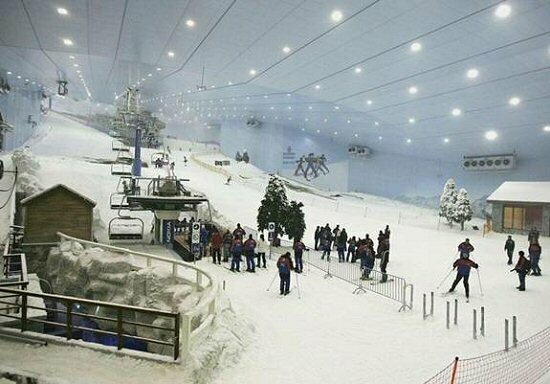 In a city dedicated to making the impossible possible, is the Middle East’s very first indoor ski resort: Ski Dubai. Located inside the Mall of the Emirates is a 22,500 sq. metre alpine adventure, equivalent to an area of three football fields. First opened in November of 2005, it is yet another architectural marvel created by the visionary minds of Dubai. This expertly engineered hall is maintained at a temperature of -1 °C during the daytime operation hours, and is lowered to -6 °C at night to allow for the creation of the real snow that covers its slopes. The angled hall is supported by gigantic columns that flank the structure of the Mall of the Emirates and creates an 85 metre high indoor mountain. Five slopes of varied difficulty levels are spread across the length of this artificial mountain and include a 400 metre long stretch, the world’s first indoor black run. 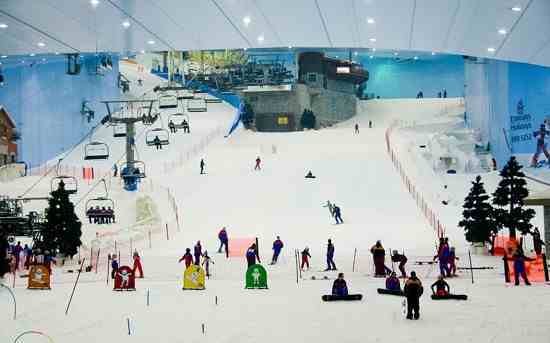 For those still learning the art of skiing or snowboarding, Ski Dubai also offers a beginners slope and a freestyle zone for visitors to practice their technique and perfect their stunts and tricks. The resort is great for group ski holidays, with plenty of fresh food and relaxation areas. At the base of Mount Ski Dubai is a pro shop that offers advice on equipment and has a staff of trained professionals who are happy to instruct newcomers in the techniques necessary for their first alpine adventure. Before embarking up the slopes, you can get a snack and something warm to drink at the St. Mortiz Café, or if your hunger and thirst return during your run, stop in at Avalanche Café at the mid-way point and take in their spectacular view. Get to the top of the slopes in comfort with your choice of quad chairlift, tow lift, or flying carpet lifts. As Dubai is a coastal desert city, they make your trip more convenient by including the price of clothing and equipment rentals in the price of admission, so you won’t need to bring your winter gear on your visit to the Persian Gulf. Once you have had your fill of the skiing and snowboarding opportunities offered by Ski Dubai, head over to the adjoining Snow Park. The Snow Park itself is 3000 sq. metres and has a wide variety of fun and exciting activities for the whole family like bobsled runs, ice slides, climbing towers, giant rolling balls, and even an ice cave. While enjoying your time at Ski Dubai, keep an eye out for their newest residents, a family of snow penguins. Ski Dubai is only one of a wide host of accommodations and destinations in this rapidly expanding super metropolis and if you’re seeking a spacious apartment to rent in Dubai, AAJ Property has a great selection of luxury properties that are close by to the city’s top shopping area. While visiting the world’s tallest structure, Burj Khalifa or shopping at the world’s largest mall, or just taking in the warm Persian Gulf air, make sure that you don’t miss out on the opportunity to experience this alpine oasis. This entry was posted in Skiing, Travel, Winter Sports and tagged Desert, Dubai, Ski, Skiing. Bookmark the permalink.